Sita Abellán is a thoroughly modern muse. Discovered through Instagram, by Rihanna no less, Abellán has become the face of Dolce & Gabbana, counts the likes of Jeremy Scott in her crew and has walked for everyone from Fenty X Puma to Faust Puglisi. She’s also a respected DJ, budding designer and all round influencer queen. Who better then to help us celebrate 75 issues of fusing music and fashion? 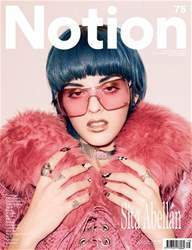 Sita Abellán is our first cover for Notion 75.